A crib is one of the largest investments you'll make as a new parent. Making sure you have the right crib for your baby is imperative for their comfort and - most importantly - their safety. If you're expecting twins, you may be wondering how to go about choosing the best crib for twins. Luckily, choosing a crib for your twins doesn't have to be difficult. We've narrowed down 5 of the best options as well as what to look for. Do you need separate cribs for twins? DaVinci's mini crib converts from a crib to a twin-size bed frame to transition your child from their infant years to toddlerhood. It's modeled after their popular full-size Kalani model, but they've made it more compact so it's easy to fit two side by side. At about 40" long and 26" wide, it's suitable for fairly small spaces. With a maximum weight capacity of 50 pounds, you won't have to worry about your child outgrowing the crib even through their toddler years. Four different mattress heights allow you to keep your child safely in their crib no matter how active they become. Available in five different finishes, from sleek black to bright white, the Kalani fits seamlessly into any color scheme. It's finished with a non-toxic, lead and phthalate-free paint. Its reasonable price tag and compact size make this an excellent option for someone who wants to buy two separate cribs for their twins. This mini crib from Dream on Me can be converted from a traditional crib to a daybed and an adult twin bed. Measuring at 39" long by 23" wide, it's compact enough to put two cribs side by side. It weighs only 20 pounds so it's easy to move from room to room as needed. It's suitable for holding up to 25 pounds, so it will last your child through their early toddler years. As your child grows, the crib's mattress height can be adjusted to three levels to prevent them from climbing or falling out. You can choose to purchase the crib with or without a mattress, although many users were not impressed with the quality of the included mattress. A separate mattress can be purchased, but make sure to check the dimensions since this mini crib won't fit many standard mattress sizes. All of the materials are non-toxic and free of phthalates, latex, lead and BPA. The crib itself is sturdily constructed and stable, so you can have piece of mind while your little ones are sleeping. There are seven finishes available so your crib can blend into virtually any color scheme. And it's surprisingly affordable, so buying a separate crib for each twin is within most budgets. This portable mini crib from Delta Children is lightweight and compact, making it a good option for parents who want two smaller separate cribs for their twins. When assembled, it measures 39" long and 25" wide. It folds flat for storage, measuring 6" when fully folded. For additional portability, it has four hooded caster wheels. Rated for 35 pounds, it's perfect for infants through toddlers. The included one-inch mattress can be adjusted to two different heights as your babies grow. 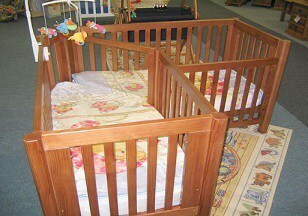 The entire crib is made from solid wood, and parents were overall impressed with its quality and sturdiness. Available in five different finishes, this sleekly designed crib fits into virtually any room decor. All of the wood is free of lead and other toxic elements. Graco's Pack 'n Play conveniently converts from twin bassinets to a play yard. The padded bassinets are comfortable for napping and easy to remove for playtime. It's lightweight and portable, weighing only 29 pounds. Measuring 46" long and 35" wide, it will fit neatly into any space. The bassinets are large enough for babies up to about five months; once they are able to push up on their hands and knees, they should be transitioned to a more traditional crib. Designed with on-the-go parents in mind, it's made with wheels and a convenient squeeze latch to fold the whole unit for easy storage. An included storage bag makes it even easier to bring along. The mesh sides allow for maximum ventilation to keep your babies cool and comfortable. Designed specifically for use with twins, the BabyHome So-Ro cradle is a unique option for parents of twins. 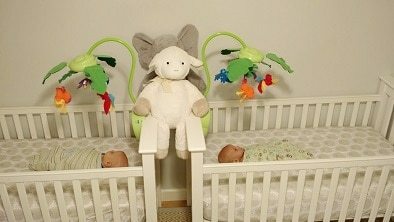 The rhythmic rocking motion soothes babies to sleep, while a removable divider can be left in or out to allow your twins to see each other or remain separate. At about 32" wide and 43" long, it's perfect for small spaces. It's a little on the heavy side, weighing in at about 50 pounds, but most said that it wasn't too difficult to move. The So-Ro cradle is suitable for newborns until they begin to turn over onto their stomachs, so unfortunately it doesn't have the same kind of longevity as many other cribs. Two mattress pads and two fitted sheets are included to fit each slot perfectly. It's available in two finishes: natural walnut and white. You don't necessarily need to buy two separate cribs for your twins, at least in the beginning. When your babies are still small and not moving around much, sharing a crib is an option. However, once they start moving around, it's best to separate them. 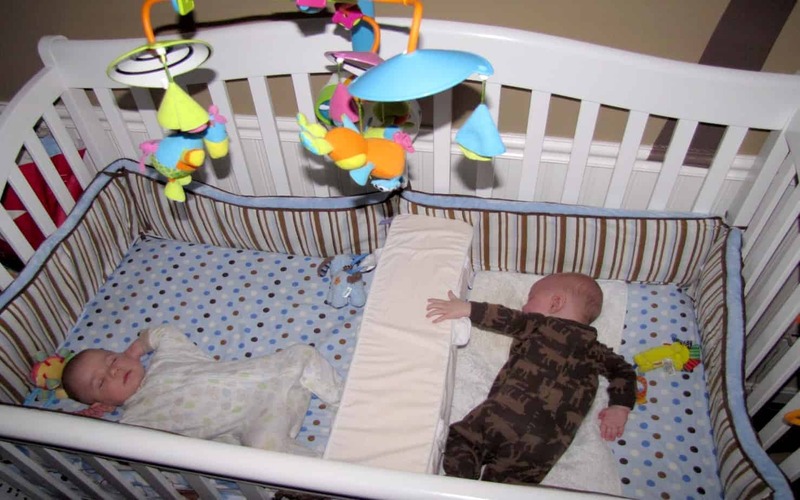 Babies that share a crib are at a higher risk for injury and may disturb each other's sleep once they are more mobile. 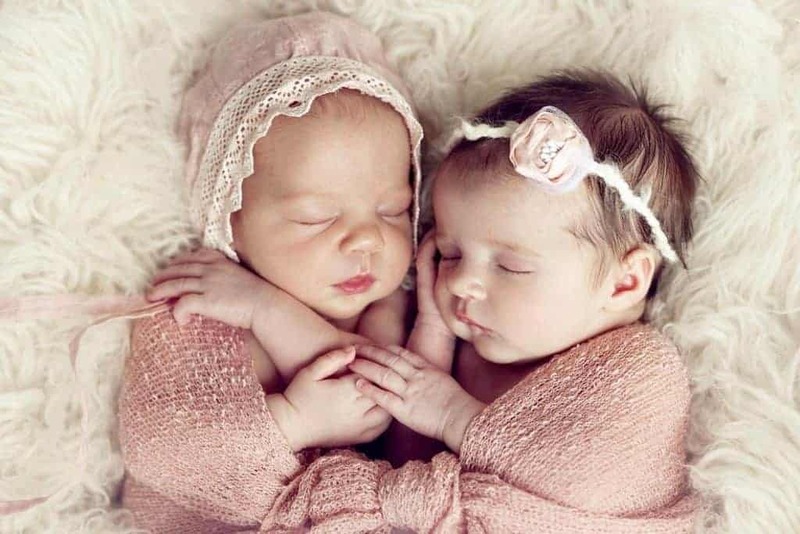 There are a number of different options available for parents expecting twins. You can either choose to purchase two mini cribs to sleep the twins separately, or you can opt for something specifically made for twins. Convertible mini cribs are a great option for parents who want the most bang for their buck. They start out as a standard crib and can then be converted to a few different arrangements, depending on the model. Typically they will convert into a toddler bed, but some models can be converted into adult-size beds. Many parents opt to buy two separate mini cribs for their twins. Their compact size allows them to fit side by side in a room without taking up too much space. While they might cost more upfront, a good convertible crib will last for many years and pay for itself in the long run. A twin privacy crib uses a removable dividing panel to separate two babies in a single crib. The removable divider allows the babies to sleep together while they are very small, then separate them as they get older and begin to move more. Two-level cribs might be a decent option for very small spaces, since they make more use of vertical spaces. However, some experts caution against the use of two-level cribs, which are built like small bunk beds. On top of being expensive, the baby on the bottom is confined. First and foremost, your crib should be stable. Your baby's safety is paramount, so look for something that is well-built and sturdy. Steer clear of used cribs if you can; since safety standards are constantly being updated, even a crib that's only a few years old might be out of compliance. Read up on the most recent safety standards by checking a source like Consumer Product Safety Center's Safe to Sleep site. Modern crib mattresses are often made of memory foam, while older models use traditional innerspring mattresses. Either option is fine, but many parents prefer foam mattresses for their increased comfort. Look for something with high-density foam. Besides just the material, it's important to look for a crib that allows you to adjust the mattress height. As your babies get older and more mobile, you'll want to lower the mattress to prevent accidental falls while they're learning to sit up. Obviously, you'll want something that will fit in whatever space you have available. Measure the space you'll be using and write down its dimensions to be sure whatever crib you purchase will fit correctly. Drop-sides: As of 2011, cribs with drop-sides do not meet modern safety standards. Drop sides can come loose and potentially suffocate a sleeping baby. Extra blankets and pillows: While many parents think that adding blankets and pillows to their crib can increase their baby's comfort, it actually poses a serious suffocation risk. Bumpers: Bumpers are designed to keep a baby from accidentally hitting their head against crib slats, but they pose a suffocation risk as well. Consumer Reports has a thorough list of things to avoid when purchasing your crib. The Da﻿Vinci ﻿﻿Kalani ﻿﻿mini crib ties together classic style with durability and functionality. From the time your babies are infants to their transition to a regular twin-sized bed, it offers a safe and comfortable sleeping solution. Its compact size makes it ideal even for small spaces, and it's priced reasonably enough that you won't have to empty your pockets to buy one for each of your twins.